Latavia is a spunky, social girl who adores school and works hard to earn good grades. She is joyful and bright, and never hesitates to run over to our van to greet us, take our hands, and lead us around, introducing us to people and showing us her classroom and home. She excels in English, and is quite fluent and talkative. Her teachers say that she is bold! Latavia is a single orphan, as her father has passed away. Both Latavia and her mother are HIV positive and are both struggle to stay healthy. Latavia's mother is a determined woman (we see where Latavia gets her drive for life!) and even though she is weakened by her sickness, she is asking for the opportunity to work and provide for her children. We are asking for a few basic need donations for Latavia, and, in addition, please consider supporting a new roadside vegetable stand for Latavia's mother. Latavia's mother, Jalia, is asking for the opportunity to work to support her family. She has researched work options, and has proposed a plan to build and run a roadside fruit and vegetable stand. 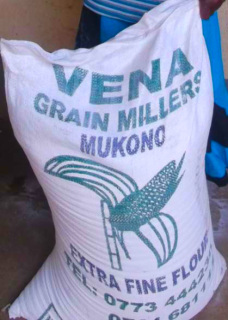 These types of small businesses are very common in Uganda, and as Latavia's family lives near a large main road, we would like to help support Jalia in her desire to work. Please consider a donation towards this cause! We will try to send any donors photos of the completed stand! Funding will provide supplies for the construction of the stand, as well as start-up inventory and products. $0 of $300 raised so far. 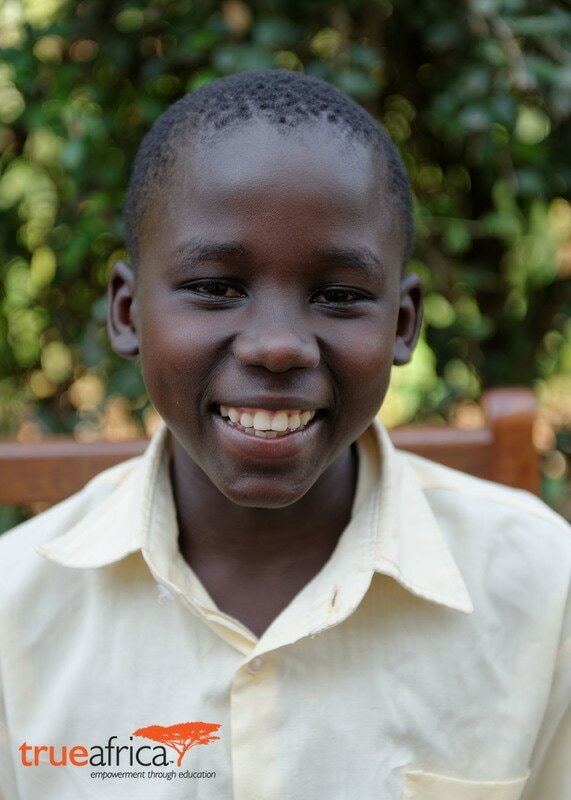 Allan is a bright, happy young man who loves school and his friends. He is a single orphan, meaning that his father has passed away. His mother is sick with HIV/AIDS and cannot care for Allen, so he lives with his elderly grandmother. His teachers and social worker say that he is promising in whatever he does, and is a disciplined boy. He enjoys raising and caring for his goats, and he has many goats! Allen's best subject is science and he would like to become a lawyer or computer engineer. 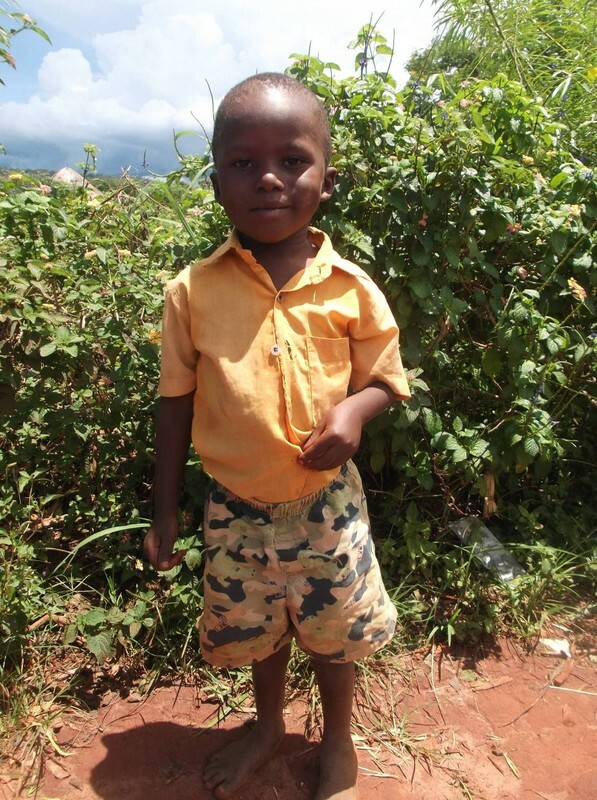 Help Allen stay healthy and do well in school be providing him some basic needs! John is a respectful young man who is shy when he first meets new people. But his shyness is quickly replaced by a dashing smile once he feels comfortable! John's mother has passed away, leaving him a single orphan. He lives with his father and four other siblings on a small plot of land where they farm mangoes, cassava and beans to sell. John excels in Biology and Mathematics, and is hoping to become a doctor! John says he hopes to get a new mattress, so he can sleep and read better. Little Janat is a favorite at her school! She is known for being a friend to everyone, and is always holding hands with the other girls and sharing with the other girls. She loves skipping rope and singing, and at home she is in charge of mopping the cement floor and washing her own clothes. Her mother has passed away from AIDS and her father is very sick with HIV/AIDS. Since her father is ill, he cannot care for Janat and so she lives with her elderly grandmother who sells extra tomatoes from the family's garden to try and earn a small income. Janat would like to become a teacher, and we think that this is the perfect fit with her caring and giving nature. You can help make sure that Janat and her grandmother have food in their home by providing an item! 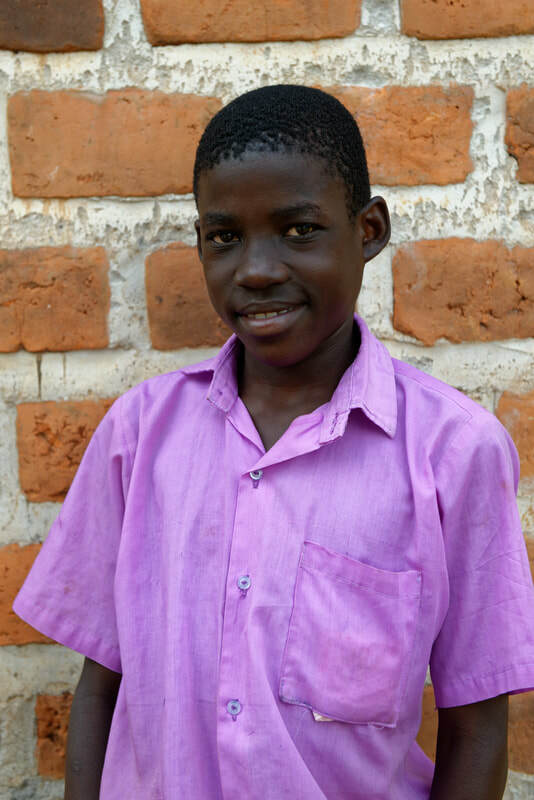 Erisa is a quiet, humble boy who is a double orphan (meaning that both of his parents has passed away from HIV/AIDS). He currently lives with his Aunt, who is generously allowing Erisa to live with her family. Though schoolwork is not easy for him, Erisa attends school and works very hard to get good grades. He enjoys Social Studies. Erisa is a sweet boy who is constantly expressing love for his sponsor, and is always appreciative of the help that his sponsor provides. By sending Erisa one of his needed items, you can help secure his place with his Aunt's family. TRUE Africa strives to keep children with relatives whenever possible, and helping to feed and clothe Erisa will make him a contributing member of his household. 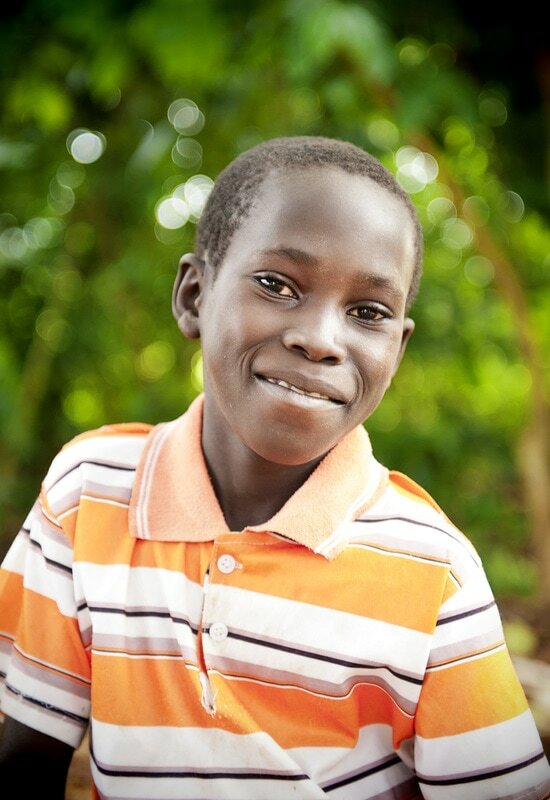 Erisa will be able to focus on schoolwork, while helping to provide for his family. have been provided by generous Donors! Charity is a lovely child who is "jolly and bright". At 6 years old, she is in 1st Grade and her favorite subject is mathematics. Charity loves jumping rope and helping her mother at home by washing utensils. Charity is active in school and hope to become a teacher! ​Charity's education is sponsored by Abby, an 11 year-old girl in Colorado, who helps run Papaya Beads (a fundraiser for TRUE Africa) to earn the funds to pay Charity's school fees. Rihana is a friendly little girl who is in 1st grade. Her teachers say that she is "clever" and that she loves school! Her father has passed away, leaving Rihana a single orphan. Her mother sells extra produce from their garden to try and earn money for the family, but cannot earn enough to provide for her children. Rihana love mathematics and singing, and she hopes to become a doctor! Rihana is sponsored by Katelyn, a 13 year-old girl in Colorado, who helps run Papaya Beads (a fundraiser for TRUE Africa) to earn the funds to pay Rihana's school fees. Shibah is a bright, social 9 year-old girl. She is a single orphan (meaning that her father has passed away). She lives with her mother who is a water hawker (her mother tries to sell water at a bus stop). She hopes to become a nurse. Please consider donating needed item(s) to Shibah! TRUE Africa volunteers found Maria on a home visit to a neighboring child. She was four years old and very wary of adults. We discovered that she was being chased away by neighbors in the village for fear that her condition was contagious. She was also not allowed to attend school because of her skin condition. TRUE Team members immediately knew that finding an educational sponsor for Maria would be crucial, to keep her as a valued part of the village and give her a chance at a successful future. After seeking medical advice, we were able to determine that she had a skin pigmentation disorder, and was NOT infectious. When a sponsor was found for Maria's education, TRUE Africa visited the local school. They presented a letter describing Maria's condition to the principal and explained that Maria was NOT infectious and should be admitted to school...and she was!! Maria is now a happy and successful little girl! She adores her teachers, who say that she has a talent for mathematical concepts. She is now able to enjoy socializing with the other children at school and her village. Maria especially loves singing and dancing. Her Vitiligo causes itching, but through her sponsor, she receives all medications to keep her healthy. Maria would like to become a nurse! Little Nusiyati is in Nursery Class. She is shy at first, but when she gets comfortable she is quite social. Nusiyati lives with her Grandmother who also cares for several other orphaned grandchildren. She is one of our "most vulnerable" children, due to her home situation. Nusiyati is successful in school, and hopes to become a teacher. Sending Nusiyati support will ensure that she has food and other basic needs met. Leticia holds a special place in everyone's heart. Despite her hardships, she is humble, always smiling and optimitic about her future. Both of Leticia's parents died from HIV/AIDS when she was just a toddler. Leticia was sent to live with her grandmother, but when a concerned teacher went to check on Leticia at her grandmother's house, it was discovered that the grandmother was an alcoholic who was neglecting Leticia. This amazing school teacher took Leticia home with her, to live with her. This was a VERY rare occurance, as it is almost unheard of to take in a child that is not your family. Leticia has thrived under the care of her teacher! She loves skipping (jumping rope) and mathematics. She is disciplined in her studies and hopes to become a teacher! ​Leticia's education is sponsored by Landmark Academy in Colorado. The children at Landmark bring their own spending money once a year to collect enough to keep Leticia in school! Timothy is known as a cheerful boy who has a willingness to learn new things at school. His father has passed away, leaving him a single orphan, and his mother is very sick with HIV/AIDS. Timothy's mother is weak, but is able to manage a small garden to grow food for the family to eat. At home, Timothy's responsibilities are to care for the family's domestic animals. He is hard-working and always takes care of his mother and is a very active participant in class. Timothy is an obedient student and enjoys mathematics. For fun, he loves to play soccer. Timothy would like to become a policeman, so he can "keep law and order". Gloria is known as a smart girl who performs very well in her studies and is an active participant in class. Gloria is in the 7th grade. She is a giving girl, who always shares what she has with the other children. Gloria's father has passed away, leaving her a single orphan, and her mother is very sick and weak from HIV/AIDS, so Gloria lives with her aged grandmother. The mother and grandmother do their best to raise a garden, but the family has many orphaned children and grandchildren, and it is impossible to met the needs of the family, let alone pay for schooling for the children. Thanks to a generous sponsor, Gloria is able to go to school every day, where she loves mathematics and singing. Gloria is hard working and hopes to become a teacher! Minsi is a jolly young boy who is in Nursery Class. He loves soccer and math. Minsi lives with his grandmother, as his mother has passed away. His grandmother is very old and cannot meet the needs of the grandchildren living with her. 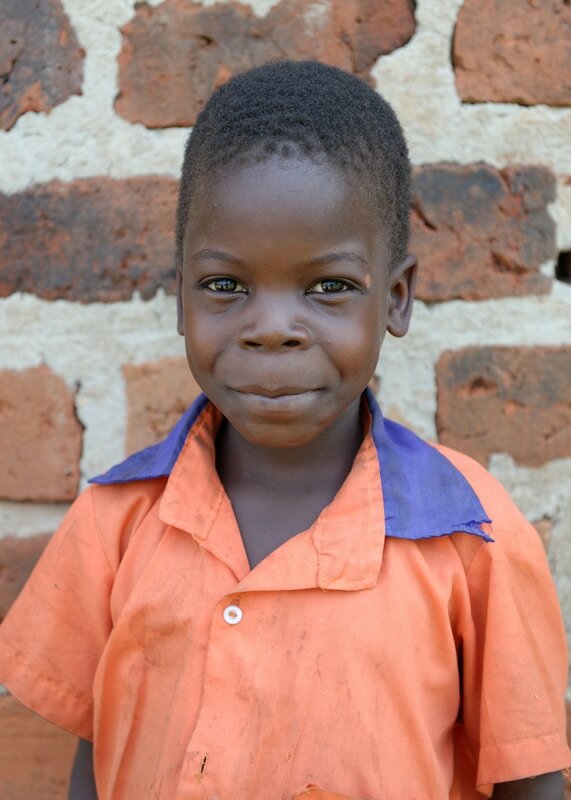 Minsi loves school and wishes to become a teacher, like his own nursery teacher! Jackie is a small, quiet, disciplined girl who loves mathematics. She greets everybody at school each day. Her favorite activity is singing. She hopes to become a mid-wife. Brivenah is a well-behaved and active little 6 year-old girl! This is her FIRST photo for TRUE Africa, and so she's a bit shy of the camera (photos are a brand-new experiences for the children we help...it can take a while to get a smile!) Brivenah is a single orphan, as her father has passed away. Her mother is in poor health, so Brivenah lives with her grandmother. She helps her grandmother at home by fetching water (which can be up to several miles round trip). At 6, Brivenah is already in 1st Grade! She loves school and hopes to become a teacher. Adorable Ashiraf is in Baby Class and loves drawing and painting. Ashiraf's father is dead and his mother's health is poor, so he lives with his Great-Grandmother. He does many chores to try and help is Great Grandmother, such as fetching firewood and water, but his Great Grandmother is too old to be able to provide for Ashiraf and the many other grandchildren and great-grandchildren living in the household. Agnes is a happy, lovely girl. Both of her parents have passed away, making her a double orphan. Agnes loves skipping (jump rope) and mathematics. Her teacher loves having her at school. Her best subject is English and she wants to become a doctor. Richard is described as humble and polite by his teachers and village. His mother has passed away, leaving him a single orphan. His best subject in English and he hopes to become a teacher. 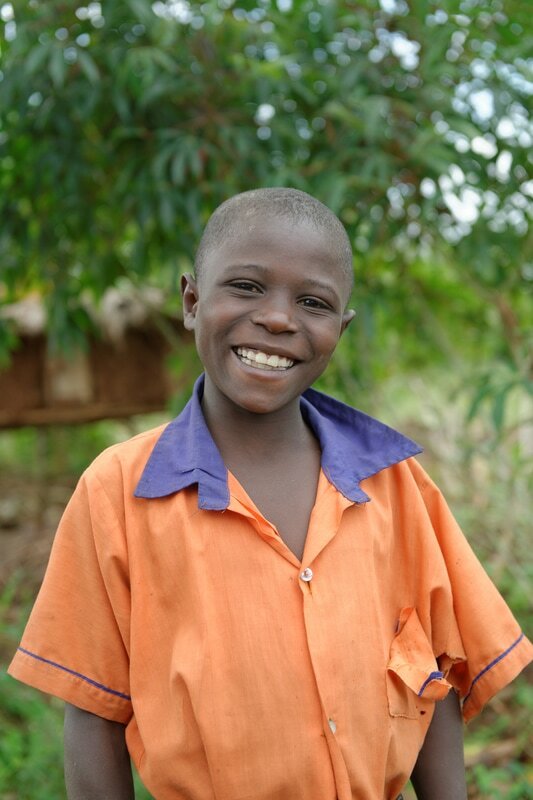 Richard loves attending school, but his lack of basic necessities makes it hard for him to focus on his studies. Matovu is a polite young boy in Nursery class. His village recognizes him as a humble boy, an admired attribute. He loves drawing and singing. His father has passed away and his mother's health is very poor. 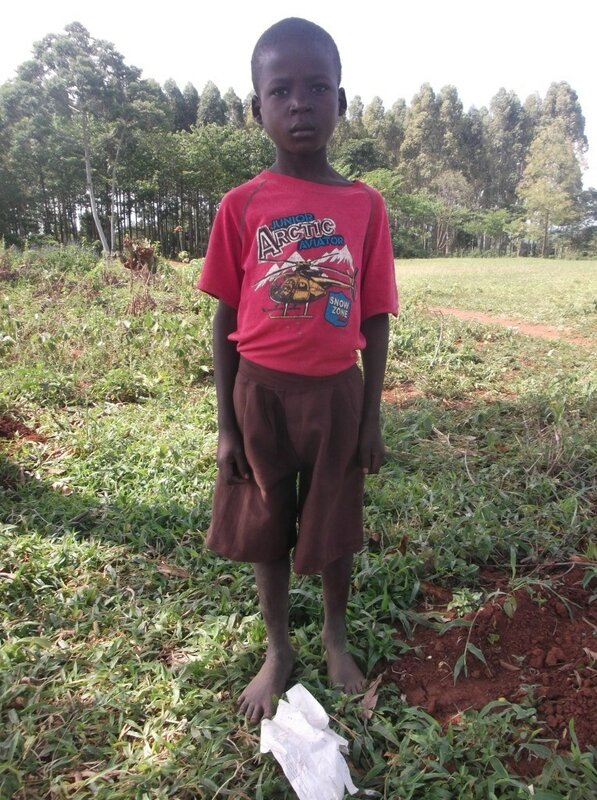 Matovu would greatly benefit from any donations, as his family circumstances are fragile. Docus is a happy and obedient 9 year-old girl. She loves skipping (jumping rope) and math. She lives with her Aunt, along with twelve other family members. The entire family lives off of what they can grow in their garden, but with so many family members to feed, there is no extra produce to sell at the market to earn money. A gift of a goat would allow Docus to start her own small business and earn an income. Peter is a happy 13 year-old boy. Peter is a double orphan, menaing that both of his parents have passed away. He currently lives with an elderly village woman. Peter is HIV positive, but through TRUE Africa sponsorship he receives all medications and care needed to keep him healthy. Peter hopes to become an accountant. Mahad is en energetic and well-loved 10 year-old boy. His father has passed away, making him a single orphan. His mother is a water hawker (tries to sell water at a bus stop) and cannot make enough money to send her children to school. Mahad is a stellar student and hopes to become a pilot. Derrick is a bright student and his best subject is English. Both his mother and father have passed away, leaving him a double orphan. As there was no family to care for him, he is now in boarding school. Derrick hopes to become a pilot, but is in need of support to have his basic needs met. Sydah is a happy 10 year-old girl who loves to sing. Both of her parents have passed away, leaving her a double orphan. English is her favorite subject. At home, her chores include fetching water, which can be several miles round trip. Regena is a friendly and hardworking little girl. She is a single orphan, as her father has passed away. Her favorite activities are drawing and singing. She hopes to become a nurse! Gertrude is a very quiet girl, but she is known in the village for being well-spoken in her native language. Both of Gertrude's parents have passed away, leaving her a double orphan. She lives with her aunt's family. Gertrude would like to become a nurse. Bridget is a lovely little girl who was taken in by one of her school teachers when her father passed away and her mother became too sick to care for her needs. Her teacher, Ms. Rebecca, made sure Bridget stayed in school by paying her fees until a generous TRUE Africa sponsor took over Bridget's fees. Bridget enjoys all athletics and is a wonderful student at school. She fetches water and helps wash clothes at home. Emecy is described as a boy who "is happy all the time" by his social worker and teacher. Emecy's father has passed away and his mother is very sick and unable to provide for the family. Emecy is a wonderful example of how a gift of a goat can help a child start a business and make an income. With his initial gift of a goat, he has been able to breed many goat kids, which he has sold to take care of his family, including being able to pay to cement the floor of his family's home! Emecy hopes to become a teacher. Shafik is an active little boy who absolutely loves singing and dancing. His favorite subject is English, and his duties at home include fetching water (which can be several miles round trip). Shafik's father has passed away and his mother is very sick with HIV. Shafik in is need of any support that can be sent to him, particularly a goat, which would allow him to start a small business and contribute an income to the family. Christine is a single orphan, meaning that her father has passed away. Her mother is sick with HIV/AIDS and cannot support the family. Christine is a bright, healthy child who loves science. At home, she collects firewood and washes the utensils for her family. Her teacher love having her in class, as she is very well-behaved. Noe is a very social and well-loved girl in her village. She is not shy at all, and eagerly engages with TRUE Africa team members, always thanking them for her sponsorship and offering to sing for them. She is known for her singing, and often leads the school choir in dancing and singing. She is bright and a natural leader. Noe lives with her elderly grandfather and loves social studies. Catherine is a humble 13 year-old girl who loves school and learning English. She loves to play games and helps with housework at home. Her family lives off of the garden they grow, both for food for the family and selling extra produce at the local market. Eridad is a double orphan, meaning that both of his parents have passed away. He lives with his aunt. He loves both mathematics AND English and his teachers say he is active in class and participates. His teachers say that Eridad is a disciplined and promising student and they think that he will be able to achieve his goals! He hopes to become a Nursery Teacher. Edith is a lovely and jolly girl! Her father has passed away and her mother is sick with HIV/AIDS and cannot care for Edith. Edith lives with her Uncle and her responsibilities at home include fetching firewood. 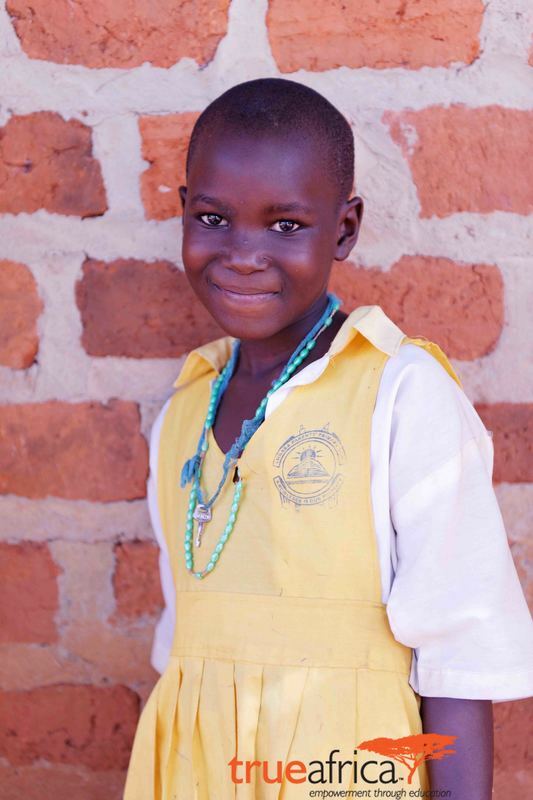 Edith enjoys going to school, especially mathematics. She hopes to become a teacher! Patrick is a humble and hardworking boy. He has a condition called strabismus, which makes his right eye unable to focus. Despite this, he is known as a good "digger", meaning he is good at using a hoe to break up the hard orange clay soil in his family's garden, to prepare the soil for planting. Despite digging most of the day, his teachers say he takes good care to wash himself and stay clean and well kept. 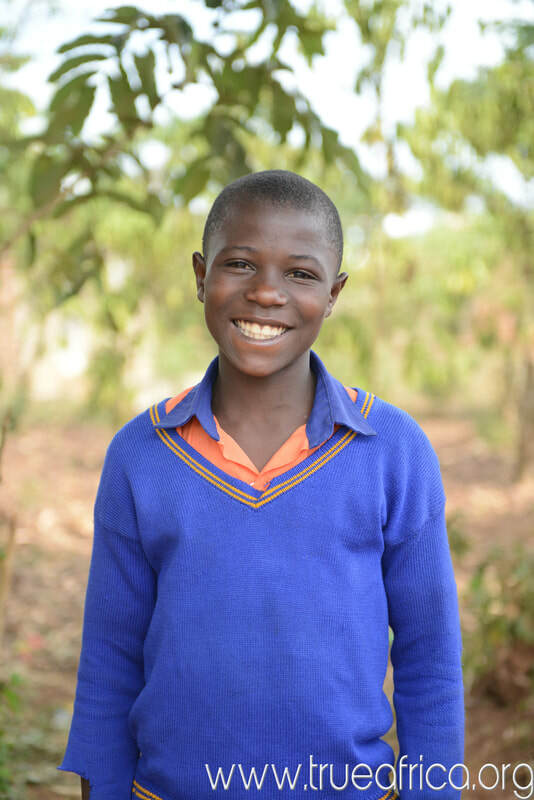 Patrick's father has passed away, and his mother is very sick with Malaria, so Patrick was recently moved to a boarding school, where he can get good meals and care from his teachers. 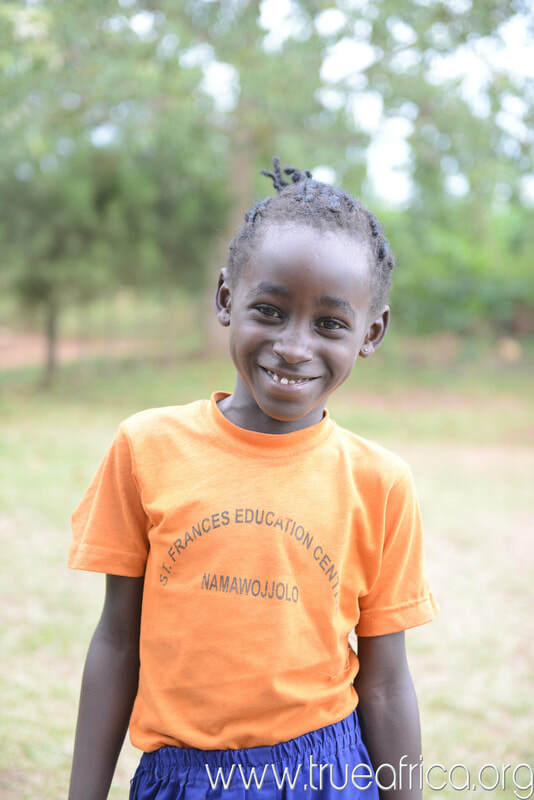 Patrick's favorite subject is science, and he would love to become an engineer! Peace is well-loved by all the children at her school and in her village! Her teachers say that she is quite friendly and very social with the other children. She says that her favorite activity is "playing with others". Both of Peace's parents are very sick with HIV/AIDS. Her father tries to grow enough food for the family in the garden, while her mother tries to sell sodas at a local bus stop. At home, her responsibility is to fetch water, which can be several miles round trip. Her favorite subject is English, and she hopes to become a doctor! Gloria is a beautiful and caring girl! She loves to read and attend school. Her chores at home include washing her clothes and the family's dishes. Goria's father has passed away, leaving her mother to care for the family. Gloria wants to become a teacher. Gloria is sponsored by Josh, a 13 year old boy in Colorado. Naome is a bright, well-disciplined young woman who enjoys school. Her father has passed away, leaving just her and her mother. Naome suffers from sickle-cell anemia, but thanks to her caring sponsor, all of Naome's medications and healthcare costs are covered and her health is now stable and good. At home, she helps her mother by fetching water (which can be several miles round trip) and she takes care of a their chicken poultry project. Naome's favorite subject is English and she adores playing soccer! Akim is a hard-working young man who carries many responsibilities. Both of his parents passed away when he was young, leaving him as the head of the household, over his two younger brothers. Akim went out to earn money to care for his siblings, by digging for neighbors (chopping the orange clay soil with a hoe), fetching water for neighbors (which can be several miles round trip), and caring for his family's domestic animals. 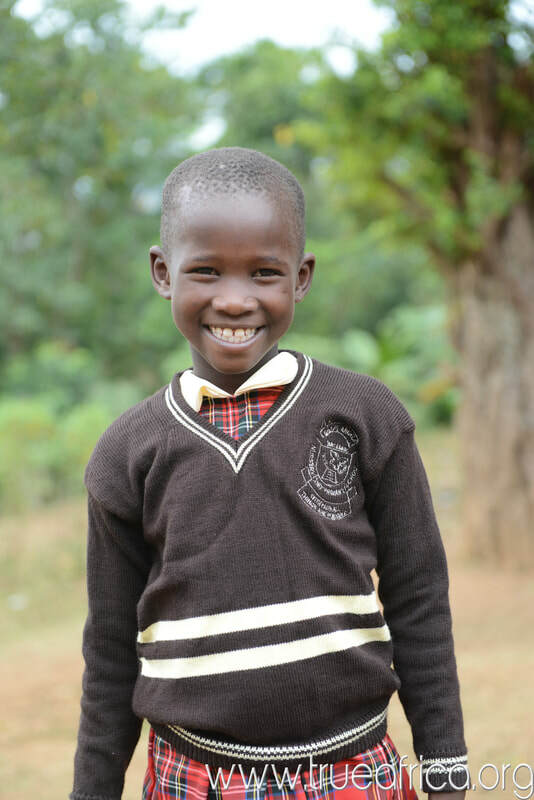 When a sponsro was found for Akim, he began attending school, where he enjoys studying agriculture and economics. At home, he has many chores, as he is the head of the household, including washing the family's clothing and cleaning their home. Akim would like to become a veterinary doctor. Any food sent to Akim will also support his two younger brothers, as they share all donated items. Fahad is a clever, social boy whose father has passed away. At 9 years old, he is in the 3rd grade! Fahad loves mathematics and is hoping to become an engineer. At home, he works hard, cutting back the long grass to make room for the family's garden. Fahad absolutely adores his goat, which his sponsor gave to him. Fahad is sponsored by Jordan, a 14 year old boy in Colorado. Devis is an active boy, bright in class and a boy who loves to make friends at school and in his village. He loves science and enjoys playing soccer. Devis is a single orphan, meaning that his father has passed away. He currently lives with his mother, who is very sick. Devis is also HIV positive, but because of his sponsorship through TRUE Africa, he has access to a local clinic, nurse, and needed medications. He wants to grow up to be a "great farmer". Tonny is the only survivor in his family; when he was very young, his older brothers and sister passed away shortly after his parents died from HIV/AIDS. Tonny lives with his aged grandfather, who is an illiterate peasant farmer. Even though he has suffered great loss and hardship in his life, Tonny is known for his optimism and happy personality. Although very soft-spoken, Tonny socializes well with children and adults alike. Tonny enjoys social studies at school. Latavia is a tiny girl who is "jolly and bold"! As you can see by her smile, she is friendly and engaging! Latavia's mother was a nursery teacher, but is now sick and weak from HIV and can no longer teach or even work their small food garden. Latavia also has HIV. Her generous sponsor not only supports her education, but gives Latavia access to all the medication she needs and a nurse to care for her. We have no doubt that this little one will go far in life! When asked what she loves, she replied, "Singing and modeling!!" Her teacher says she is disciplined and very interested in school...perhaps with a future in teaching just like her mother! Aksam is a "bright, active, social, friendly boy who can express himself well and shares with others what he has". Aksam's father is absent from the family and his mother cannot care for the family. Aksam lives with his aged grandmother, who cannot provide for the grandchildren living with her. Aksam excels in writing in loves to play soccer. Aksam's ambition is to become a pilot. Teopista lovely and jolly girl. She is a single orphan, meaning that her father has passed away. In addition, her mother is very sick with HIV/AIDS and cannot care for Teopista any longer. She was taken in by her Uncle who is a peasant farmer and cannot meet most of Teopista's basic needs. Always with a bright smile on her face, Teopista hopes to become a doctor. Anthony is a happy and social boy! His favorite subject is English, and he is known for being able to express himself well in his native language. Anthony lives with his elderly grandmother, as his father has passed away and his mother is too sick to care for the children. At home, his responsibilities include washing the utensils and dishes, as well as fetching water (which can be several miles round trip). He loves singing, and he hopes to become a doctor! Luke is a new student, just starting Baby Class (preschool). His teachers say that he loves school and is eager to attend class! Luke's father has passed away and his mother is very sick with HIV/AIDS. Luke lives with his grandmother, because his mother is too weak to care for him. Luke helps his grandmother by fetching water (which can be several miles round trip). Luke and his grandmother live off of the food that they can grow in their small garden, but the family has no income source. Luke's favorite subject is mathematics and he loves to play soccer! Janat is a humble, happy girl who is in the 1st grade! Janat's mother has passed away and her father is very sick with HIV/AIDS. Janat lives with her elderly grandmother, as her father cannot care for her. Her grandmother sells tomatoes by the side of the road to try and earn an income. At home, Janat is in charge of washing her clothes and mopping the floor of her little house. She loves reading and literacy subjects at school, as well as swinging on the school's tire swing and "skipping" (jumping rope). Janat suffers from a headache problem and poor health--her top priority items for donation are nutritious food items such as chicken and posho (corn grits). Janat hopes to become a teacher! Angella is a social, joyful little girl! Her teachers say that she is "respectful of every person", which is a wonderful compliment! Her father has passed away, which means that she is a single orphan. Angella lives with her mother, and her responsibilities at home are cleaning the house (such as sweeping the dirt floor and washing utensils). She loves singing and her favorite subject is English. Angella loves school and would try to attend, but if she hadn't paid her fees, she would be "chased away" from the school by the teachers. 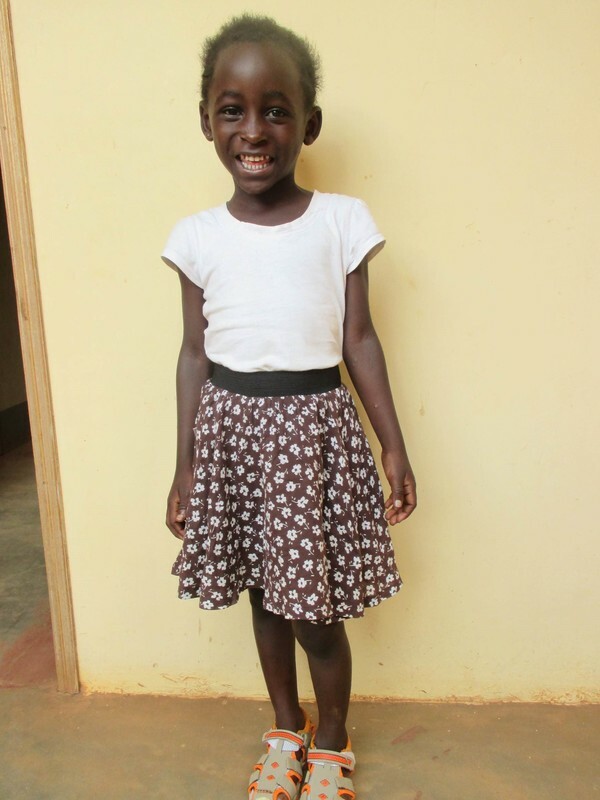 Now that Angella has a generous sponsor, she will be able to go to every day! Angella hopes to become a nurse! Shakira is a shy, small, and slender girl who is bright in class and likes going to school. She loves school and does very well in her studies, especially in mathematics. She loves skipping (jumping rope) and her responsibility at home is to fetch water (which can be several miles round trip). Shakira's father has passed away and her mother is very sick, so she lives with her grandmother. Her grandmother sells homemade chapati bread on the side of a busy road to try and earn an income. Shakira would like to become a teacher. Before Shakira had an educational sponsor, she would try to go to school every day, only to be chased away (literally) by the teachers because she could not pay her fees. 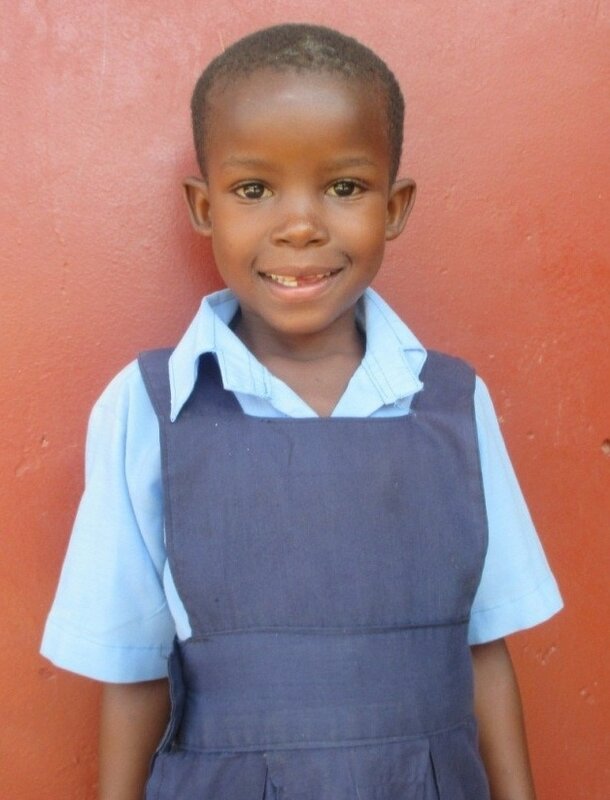 Shakira now thrives in school thanks to her sponsor who covers her fees. Daphine is small, jolly girl with a bright smile that lights up the room! Her mother has passed away, and when her father remarried, Daphine was able to stay with the family (very rare). Her family of eight lives in a tiny house, with a cement floor. Daphine is responsible for mopping the floor of her home. Her teachers say that she is hard-working in her studies, and that her best subject in English. 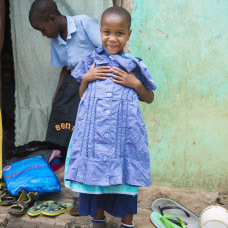 Known for being a humble little girl who loves to sing, Daphine hopes to become a teacher. Allan is a humble, social boy who is playful with the children in his village! Allan's father has passed away, and his mother's health is fair, though she is sick with HIV/AIDS. He is known as a boy who always helps his mother and family. Allan's mother and siblings are well-known in the village as a nice family. He loves mathematics and playing soccer. He would love to become a teacher! Julius is a happy boy who loves his mother very much. His father passed away from HIV/AIDS, leaving him a single orphan. His mother is also very sick with HIV/AIDS. Julius is disciplined and obedient, and is always thanking his teachers for helping him. He performs well in his studies and is an active participant in class. At home, his responsibility is to clean the house for his mother. Julius is a caring boy who would like to become a doctor! Abdallah is a gentle, friendly boy. Both of his parents passed away from HIV/AIDS when her was very young, leaving him a double orphan. Abdallah was raised by his grandmother, who was a caring and kind woman. When we first met Abdullah, he was quite shy, but over the years, he has matured into a social, confident, young man! He has a cheerful laugh and he enjoys being with his friends. Unfortunately, Abdallahs beloved grandmother passed away recently. With no other family willing to take Abdallah in, he was moved to a boarding school, where he receives good meals and care from his teachers. His favorite food is sweet potatoes, and he hopes to become a pilot! Zainah is a social little girl who adores attending school, thanks to her generous sponsors. She is known for being obedient and helpful to her mother. At home her responsibilities include fetching water (which can be several miles round trip). Zainah's father has passed away, leaving her a single orphan. He mother sells extra produce from their family garden to try and support the family. 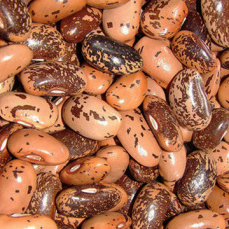 Zainah says that her favorite meal is posho and beans, so we hope to get a donation of food to take to her! Zainah is a good student, and her best subject is mathematics. She hopes to become a nurse. 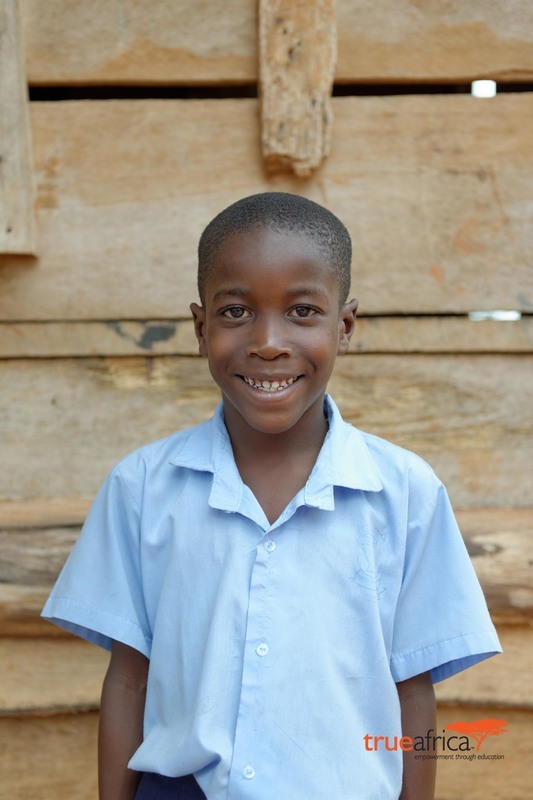 Jospeh is a humble, cheerful little boy who loves goes to school every day! He enjoys learning and the activities at school and participates in his class. Both of Jospeh's parents are very sick with HIV/AIDS. Despite this, his mother has generously taken in other children who need a home. However, due to their sickness, Joseph's parents are too weak to provide an income for their large family, but do their best to grow a garden to feed everyone. Joseph loves learning English and playing soccer. He hopes to become a doctor! Robert lives in the little village of Buyomba, on the shore of Lake Victoria. Robert is a very obediant boy, and loves attending his church every Sunday. Robert's father has passed away, leaving him a single orphan. His mother cannot support him, so he lives with his aged, illiterate grandmother, along with several other grandchildren. At home, he is diligent in helping his grandmother by fetching water (which can be several miles, round trip), grazing his goat, washing the utensils, and sweeping the dirt floor of his home. Robert's school performance is very good, and he loves reading! He hopes to become a pilot! 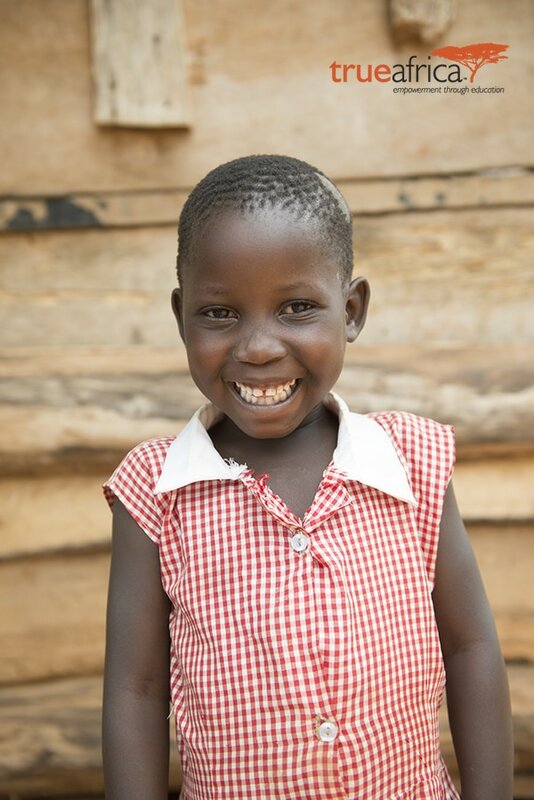 Irene was joyful and excited when she heard that we had found a sponsor for her education! Her father has passed away, leaving her a single orphan. He mother is extremely sick with HIV/AIDS and cannot provide for Irene. Irene has no other family besides her mother that can care for her. Irene's situation is precarious, but through her TRUE sponsorship, she receives an education, lunch every day, and access to the local health clinic. Any assistance, espeically food, is greatly appreciated. Her teachers say that she is jolly and happy. At home, she cares for her mother and is responsible for washing all the dishes. She is a fast runner and loves to go jogging. Irene hopes to become a teacher! Margret is a humble girl who can express herself well. Both of Margret's parents passed awaywhen she was young. When Margret's parents died, the three children were split up. Her sister was sent to live with an aunt, and, unfortunately, Margret does not know where her brother was sent and still does not know of his location. Marget was sent to live with her grandmother, who has also taken in 7 other grandchildren. Margret's responsibilities at home include washing the dishes, cleaning the home, and doing the cooking. She also helps her grandmother cultivate coffe and sweet potatoes in their small garden, which they then sell at the local market to support their large family. Margret loves both math and science and she says, "they are easy to learn". Margret hopes to become a nurse so she "can help sick people". Papaya Beads is a fundraiser for TRUE Africa. We work with a local woman, Esther, who rolls magazine and newspaper strips on a pin to create handmade paper beads. She then strings the beads together to make beautiful necklaces! We purchase our necklaces from Esther in Uganda, then bring the necklaces home. We sell the necklaces to raise money for our education programs and care items for our sponsored children. ​Absolutely 100% of the money raised through selling these necklaces goes straight to the cause. We volunteer our time to seel the necklaces and we do not keep any of the funds raised.